The park was officially opened in September 1894 but was far from complete. In February 1895 the Parks Committee decided to order 500 iron bows, priced at 6¼d each, for protecting the grass verges in the park. The following year an ornamental drinking fountain, presented by Mr. Stanley Jones in memory of his father, was officially unveiled. Also in 1896 the Gorsedd Circle was added, to mark the 1897 National Eisteddfod of Wales taking place in Newport. Two bowling greens were added in 1904 and tennis courts in 1907. In 1910 the rustic tea house was built near the pavilion to provide extra space for refreshments and shelter. In August 1919 the Committee agreed to accept a German field gun to be placed in the park and it would be mounted at the corner near the park entrance from Stow Park Avenue. In September 1922 the Parks Committee gave instructions that the German guns at Belle Vue and Beechwood Parks were to be painted. 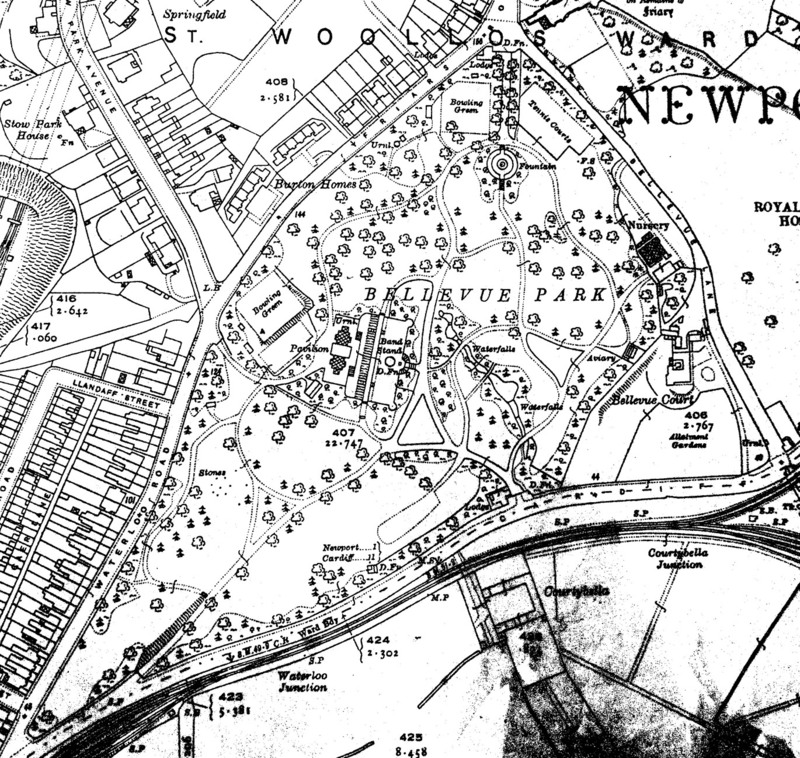 In March 1930 the Committee was informed of a plan to widen Cardiff Road requiring a strip of Belle Vue Park to be lost. The same plan included levelling part of the children's playground. The Committee agreed that the Borough Engineer make arrangements with the contractor carrying out the road widening works, for tipping and levelling in the park. It was also agreed to plant trees and shrubs in due course. In July that year the Committee decided that the second entrance to the park off Cardiff Road should be moved to the junction of Cardiff Road and Waterloo Road, at an estimated cost of £300. This can be seen on Ordnance Survey maps for the 1920s and 1930s. Compensation totalling £1,130 was received for the land fronting Cardiff Road lost in connection with the widening of the road and in November 1932 £180-3-0 of this was put towards the cost of a putting green. Ii was decided in December 1932 that a telephone be installed in the Parks Superintendent's house at Belle Vue Park. Shortly after this, in February 1933, the Parks Committee decided that living accommodation for the Parks Superintendent would be provided at Beechwood House, and that the house in Belle Vue Park occupied until then by the Superintendent would be let. In January 1937 the Parks Committee agreed to remove the German field gun from the park. The 1939-45 world war had a number of impacts on the park, starting in September 1939. These are described on a separate page. The grounds of Belle Vue House, at the junction of Belle Vue Lane and Cardiff Road, were absorbed into the park in 1953 after the house was demolished. Aerial photographs indicate that this space was used for allotments in the late 1940s and early 1950s. A Heritage Lottery funded restoration of Belle Vue Park took place between 2003 and 2006.